In this tutorial we are going to test the finger sensor with the Arduino. -Test with a code directly on the Arduino. -Test with a python code in MyRobotLab. // A small script to test one servo and one sensor. // to the 5V of your Arduino. // and to the PIN 2 of your Arduino. -When the power is applied, the finger will close slowly by itself, if the sensor detects a pressure it will display in the Arduino.exe monitor an information. -You may need to change the values of the sensor in the code to reach a better adjustement. Here we assume you already have installed MyRobotLab and know a little bit how to use it, if not go first to this page. -Launch MyRobotLab by double clicking the “myrobotlab.jar” from your MRL directory. -Make the same connections between your Arduino and servo motor as the image in the first option tutorial. -Copy and paste this python script to the python tab in MyRobotLab. 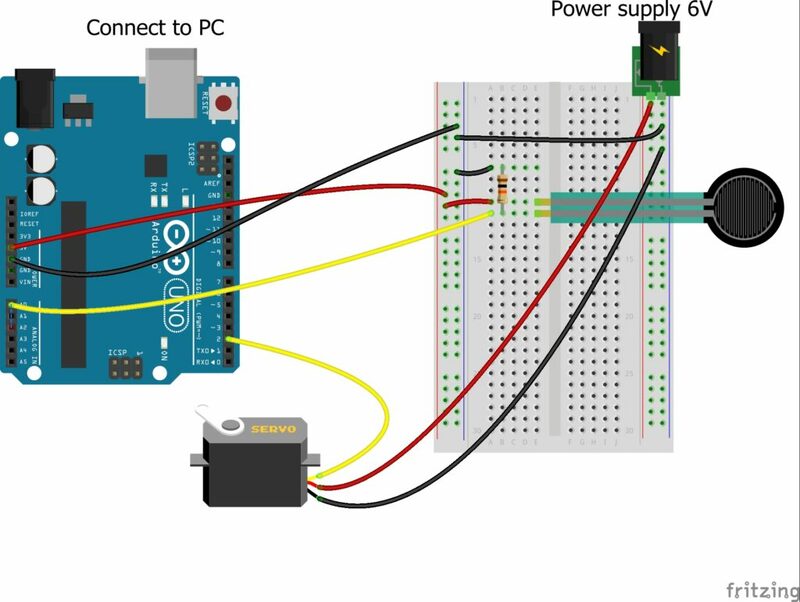 #Connect one sensor cable to the PIN A0, and the other cable to the 5V of your Arduino. #Servo will be connected to pin 2 of the Arduino. #Change the COM port in the code according to your Arduino board. -When the power is applied, the finger will close slowly by itself, if the sensor detects a pressure it will display in the python monitor an information and will stop to close and say something related to the pressure he felt.